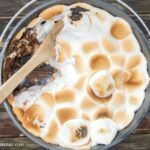 A few summers ago my husband (who is an avid dutch oven cook) came up with an idea for a quick and delicious s’mores cake dessert. 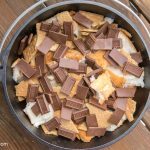 We were camping and the time and the recipe was instant hit. It’s now become one of our favorite summer desserts. Since the recipe features a pre-made cake (that you get in the bakery of a supermarket) it’s quick to throw together, no baking required! Step One: Tear the Angel Food cake into pieces and place in the bottom of the dutch oven. Step Two: Break the Honey Maid squares into pieces and cover the cake, mix a few pieces into the cake pieces. Step Three: Layer on the Hersheys Chocolate Bars (I used about 5 bars, you can use more or less depending on what you like). Step Four: Cover the top with the Jet Puffed Marshmallows. Five: Place on an already HOT grill and close the cover. Cook until the marshmallows are golden brown and toasted. About 5-10 minutes. Check frequently so they don’t burn. Heat to 350 and bake for 10 minutes or until marshmallows are browned and melted. Use a 10 inch dutch oven and use 8-10 under and 12-15 on top for this recipe. Check after 5 minutes. Then every 5 minutes after that. You just need to melt the marshmallows.